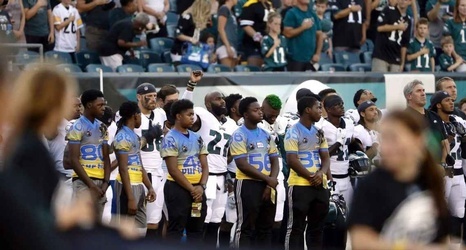 PHILADELPHIA - Eagles safety Malcolm Jenkins resumed his protest against social injustice during the playing of the national anthem prior to Thursday night's preseason opener against the Pittsburgh Steelers. Defensive end Chris Long put his arm around Jenkins in a sign of support, as he did for much of last season. Defensive back De'Vante Bausby also raised a fist. Defensive end Michael Bennett appeared on the field during the playing of the anthem and walked behind his teammates, most of whom were lined up along the sideline. Jenkins stopped his protest after the Players Coalition, which he co-founded, joined in a partnership with the league in November that calls for the NFL to contribute $89 million over seven years to projects dealing with criminal justice reform, law enforcement/community relations and education.